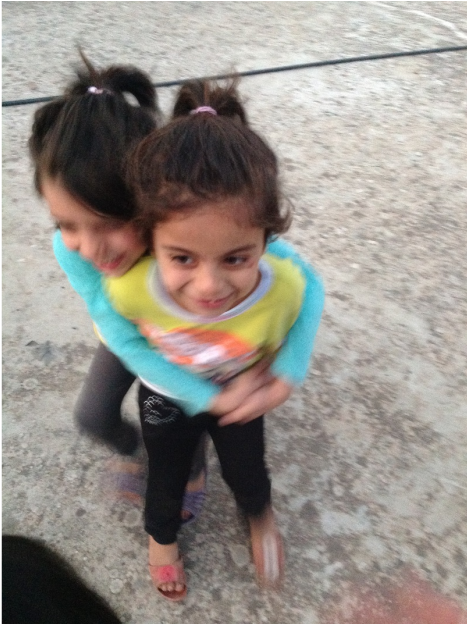 This blog captures my trip in 2012 (solo) to Turkey to go look for Syrian Refugees and offer them aid. 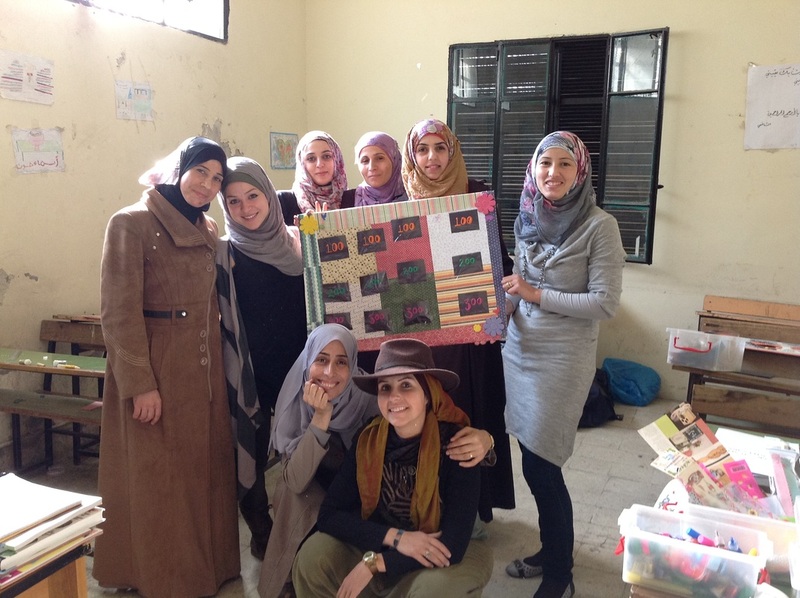 It also captures my second humanitarian trip in November 2013 to open a school and start an art therapy program in Tripoli, Dier Ammar, Lebanon. It will now capture my 2017 GREECE trip to help refugees. 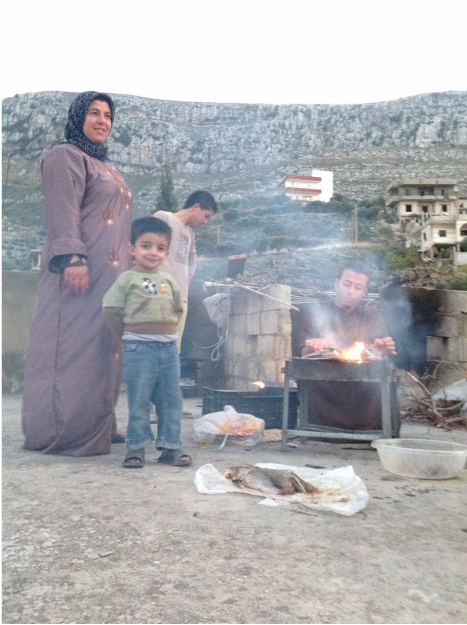 My last day in Dier Ammar, Lebanon shook me to my core. I could barely catch my breathe all day. These kids looked me in the eyes and said "Are you coming back?" I hoped I was. I told them, I wanted to. I will try. One thing I did know for sure is that I will never forget them. NEVER. Nor will I ever stop keeping in touch with Mustafa to see what is going on.. I was leaving an art teacher there to keep things going. When I arrived in Lebanon 15 days ago. There was no school. To help establish a school, set the philosophy behind it, train the teachers, and then do art with all the kids and train and hire an art teacher.. Plus buy all the school supplies, set the bus schedules, Inventory textbooks, create teacher schedules, interview 6 different art teachers and watch them teach, practice for the mural with all the kids, create the mural, clean up the mural, start a website, deal with internet shutdowns,deal with my stupid credit card that kept getting blocked every time I wanted to make a large purchase (Even though I had let the credit card company know I was going to Tripoli) and also have time to play with the kids and film a documentary... I felt like I had lived a thousand lifetimes in those 15 days. Not to mention that a crazy many by the name of Abo Samir kept making threats to the school that he would be shooting fire at the school buses or "kidnapping the American girl" (me).. I had been on my toes and probably slept about 4 hours every night. My mom was getting worried and asked me to stop working and take a break. I told her "Im only here for 15 days.. lots of work to do!" The odd thing is that none of that stuff felt like work. I felt like I was on vacation the entire time. I was so happy I couldn't even contain myself. I floated instead of walked. You know when you are so happy that that you smile giddily everywhere you go? That was me. The kids have that affect on you. To see change happen before your very eyes is magnificent. To have an idea one day and then go forth and throw every impossibility out the window and focus on the one reason why it has to work and then watch that one reason manifest itself.. This feeling right there, coupled with the strong sense of intervention for the future of Syria.. that feeling right there is euphoria. What do I mean by intervention? I mean that if we take the kids that have dealt with war, get the yucky animosity out of their system, teach teamwork, kindness, respect, forgiveness, and the idea that you can be anything you want to be.. then these kids will go back to Syria one day and contribute to the positive rebuilding instead of getting caught up in the waves of violence that occur when two sides continue life beside each other long after a war. These kids will be leaders one day. These kids will be the future. This is the goal, the idea, the hope. Tuyoor Al-Amal- Birds of Hope. They chose the name, they voted on it..
You should have seen their faces when I handed out the cards that the kids in America made.. they were touched and felt the idea of one human race. I could write on and on about my experiences.. so what I will do from here on out is just reminisce moments that stuck with me and describe them in detail. Favorite meal of the day!! Breakfast! Just remembering this now makes me want to go make breakfast right now. So shy, yet so adorable. Well, good morning to you too sleephead. Ok... now Im really starting to feel like a princess... Flowers, candy, chips, flowers, drawings.. Showered in wonderful acts of kindness from children who have little. The wonderful lawyers that have been actively helping the school out and volunteering their time. They drove us around quite a bit as well. I woke up early to get ready for teacher training. Mustafa and I had nescafe and talked about Teacher training. I apologized for falling asleep so early last night. "How did you meeting with crazy guy go?" I asked. "He hasn't shot fire on the school busses yet so its possible that he is just bluffing." I had said. "Well," he began. I knew that it was going to be a good story based on the face he made when he was starting the story. "Well... I went to meet the guy and I told him, okay I want to settle this. I will just pay you whatever I have for the days I used your school for registration. But paying $5000 was ridiculous. I don't have that kind of money and neither does the American girl. Nobody does. I cannot get it from anyone." He was smoking his ciggarrette as he recalled the story. "Sama, I told him I don't have it. He said very bad words to me and told me the most he will lower the amount to is $3000. He feels as if I have stabbed him in the back." "After I left his house, I saw 5 angry men walking towards me. I knew they were there for me and I didn't want to make a scene on the street. So they pulled me into the alleyway and grabbed me by the neck. Then I talked to them until they finally let me go. THey said, 'this is the last warning, we don't want to hurt you but this is what we do for a living and we make our living off of it. You seem like a nice guy so just solve your problem with him.' I told them that I am trying to do my best to solve it but he is making it very difficult for me. Sama, this is a very dangerous time and the guy is serious, I need you to not go anywhere by yourself. Stay in the school or stay in the house, and I know you are adventurous and like to do things, but please, they know you are here and are making threats. " "Im glad you are okay." I said to him. We then joked about how one of the guys gave him a cigarette. 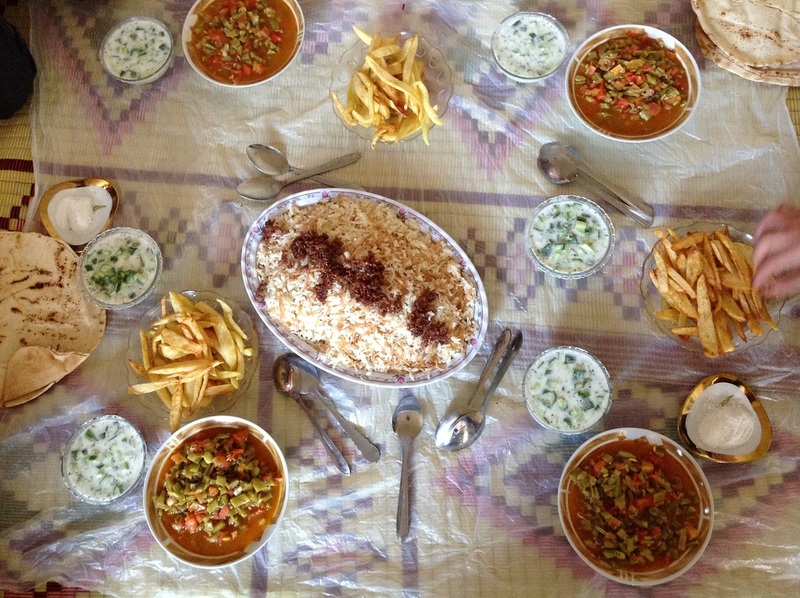 Arab hospitality, even in a situation like that! I went to go withdraw money from an ATM in Tripoli and then went exploring the Old streets of Tripoli for 20 mintues... just in time to buy fish for a rooftop bbq the following day. In short, Friday we finished the Teacher Training... I finally met OMAR!!! Finally, an art teacher applicant who looks creative and capable. I told him to come to school the next day and he can help me with the mural. I wanted to see how he interacts with kids. After the teacher training, we went home and had a wonderful fish bbq on the roof. The whole family interacted and I got to spend some more one on one time with his nieces and nephews. The more time I spent with them, the more I loved each and every one of them. Playing a game using soda tabs that encourages teambuilding, sharing, and a deeper understanding of our natural resources.. Learning how to apply it to math, art, religion, science, and all subjects. 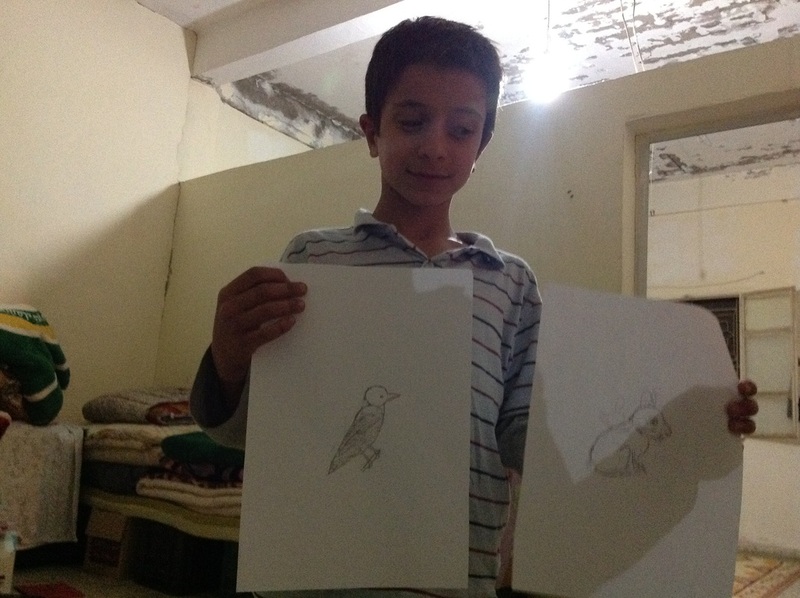 Mohammad, Mostafa's newphew, proudly showing me his drawings, after being the first to use my newly published book "How to Draw 60 Native California Plants and Animals." Gnatcatcher bird and a Cottontail Rabbit. FISH BBQ on the roof. 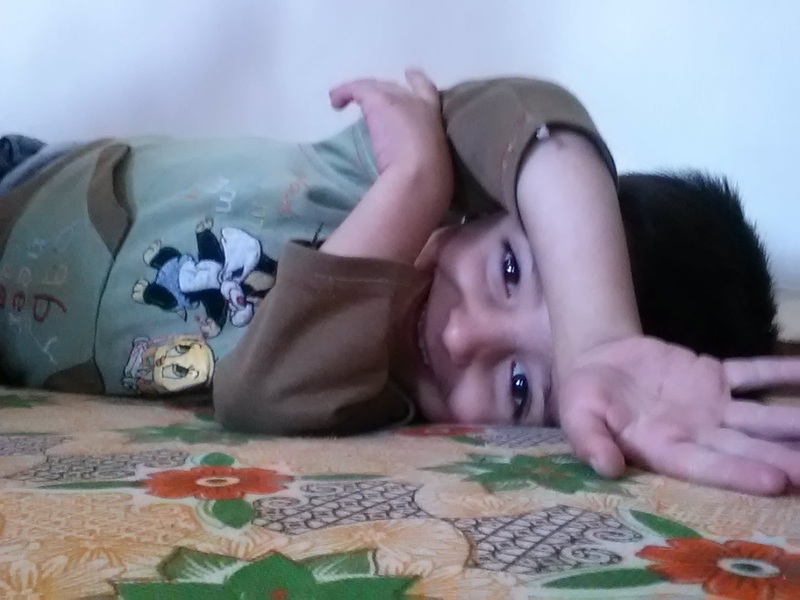 Spending time with Mustafa's Family... One of the highlights of my trip. 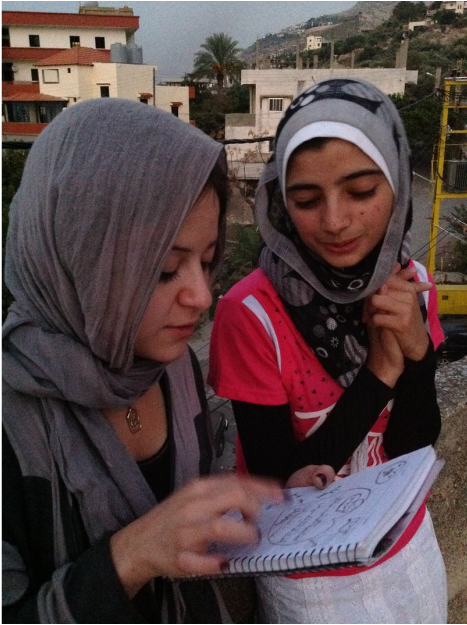 Ala'a sharing her poem with Lina... Lina had a way of really reaching deep into everyone's hearts. 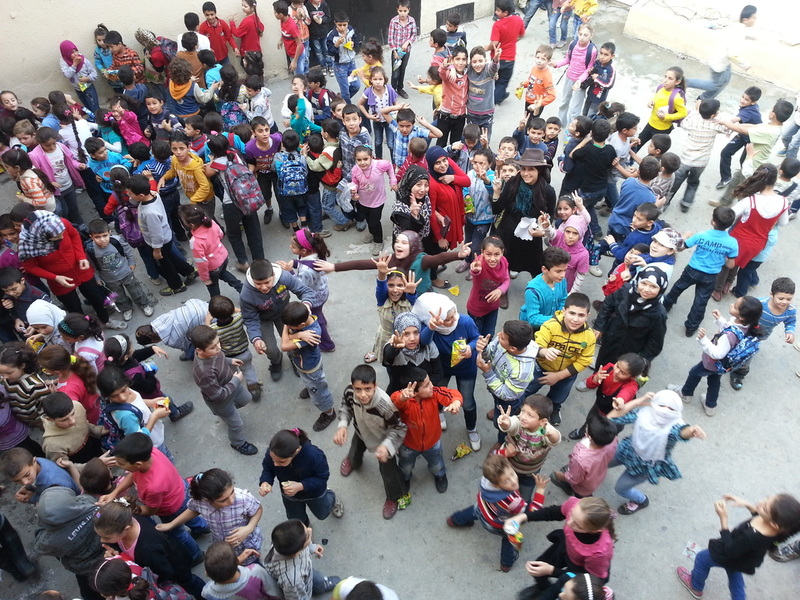 Playing a Syrian Game called "Zay Arusti?" with the family. My eyes shot open. Mom had made me nescafe. Thanks Mom! I was trying to figure out in my head the way to involve 350 students in one mural without it turning into a chaotic nightmare. How do I let them all express themselves, touch paint, and make a masterpiece, all in 4 days?! Considering the school is only about 4 hours each day. That gives me 16 hours to do a mural. Anyone who has worked with kids knows that you can divide that time in half since half of this time goes to instructions. I decided to take it one day at a time. First, I will get the first graders and second graders to do the basic stuff. 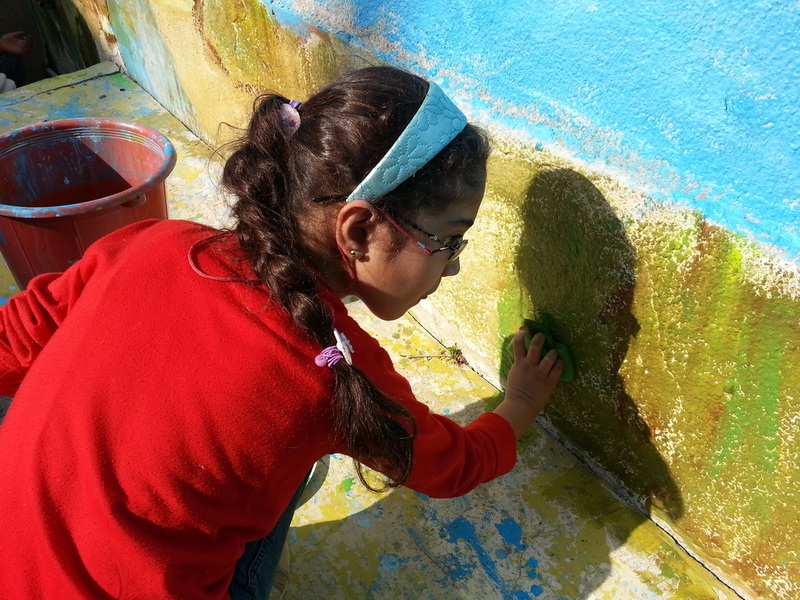 First graders can paint the sky and the second graders can paint the grass. Then, I have no idea whats going to happen. I know I need to get them out two times to paint, once to paint their background part of the mural and the other time to paint what their dreams were. I was wearing my solid black dress when I began this project. I was excited walking to school this day. I had a lot to do. Not only was the mural starting but also had a teacher training to prepare for the afternoon. And in the middle of all of that, I had to interview another teacher. No matter how many times I've done a mural before, there is always a new dynamic.. things you wish you had thought of ahead of time. One of those things was an announcement I wish I had said at the morning assembly. I wish I had said "All Children will get to paint. Every class will get a turn." But I didn't think about that. 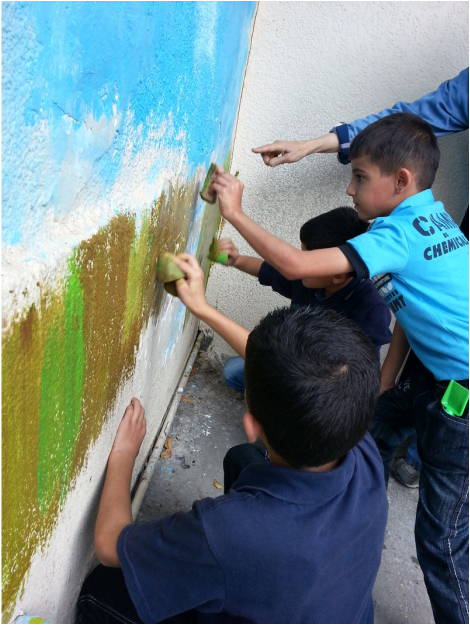 The ramifications of such actions resulted in kids scampering out of their classrooms the entire day "to get water" or "use the bathroom" and would come up to me and ask me if they could paint too. "Wait a second, you are in 5th grade! Back to your class. You will get a turn in these next few days. Don't worry!" Everyone was worried. Worried that there was paint happening outside and that their turn would be forgotten. I first started with paintbrushes. I watered down the paint and pulled out 30 flat headed paintbrushes. I put the kids in a half cirlce and said " All of you will get a turn. Please wait till I give you your brush. Then you can go to any of those palettes and dip your brush in it. Point to the wall we are painting" I said. Pointing with them to the one and only wall we were working on. I repeated it again just to make sure that no 1st grade wanderers ended up painting in areas they weren't supposed to be in. It was going well, I thought. Except that it was painfully slow. I had instructed the kids on how to hold a brush and how to do a proper brush stroke. Most kids were still holding the brush way to far away from the bristles. These were long brushes and the kids had never touched a brush let alone paint in their lives. I had an idea. "Abu Ali!" Abu Ali was the groundskeeper and everything extraordinaire. There was nothing he couldn't do. He taught a class when there was no teacher, he made coffee for everyone, he made sure the kids didn't miss their bus. He was everything to the kids. Abu ALi was wandering out and I asked him for some sponges. First he brought the kitchen sponge. Then I told him we were going to need about 15 sponges. 10 minutes later, there were 15 sponges. Thats how awesome he is. While I was asking for sponges. I turned around and saw that a little Dr.Suess looking kid, with high pigtails was painting on the black metal door of the school. She had the largest smile on her face. Out of instinct, I ran up to her and snagged the paint brush out of her hand.
" Not this wall. Did we not talk about this?" I asked her. While her and I were talking, kids near me who were holding the brush clumsily would paint an accidental stroke of blue on my dress. I sort of noticed but my attention was focused on this little girl with a huge grin on her face, the girl who had just graffitied the wall. She just smiled up at me and kept on smiling. "You are all done! Did you not paint your part already?" I asked. She nodded. "Okay wash your hands and go back to class." "I'm here for the interview" another teacher said. I turned to talk to her for a moment. " Okay, today is pretty crazy. 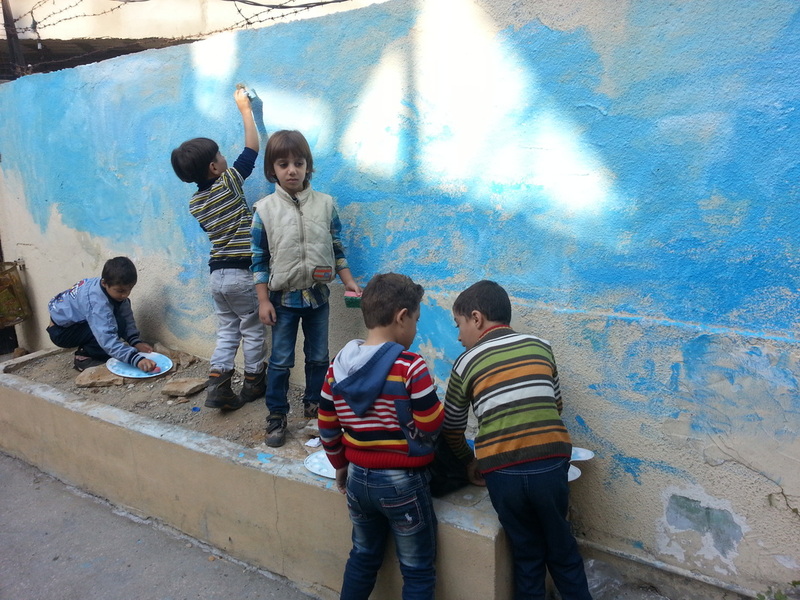 Im going to ask for your help in working with the kids on the mural project. I want to see how you work with kids, then I can interview you on what you know about art." She agreed. She was in her early twenties and wore a brightly colored scarf. I liked that about her but the one thing she was lacking was a smile. She was very serious, and for me, a smile was extremely important. My talk with her instantly came to a hault when I noticed the little Dr. Seuss girl painting the wall again, after I had just scolded her about that. "Okay, thats it kid, you are officially kicked out of the mural." I told her. I regretted it. I regretted that moment. She didn't listen, but her soul was just yearning to paint more. I wish I had filmed it as an observation of her psychological state of mind instead of treating her like a kid who was not following the rules. She still had a HUGE grin on her face, as if she had accomplished her goal and then scampered off to class. The art teacher helped me out quite a bit with the rest of the mural project, but there was something about her self confidence that was lacking. The smile was not there. I NEEDED a shining personality to be the art teacher, someone who brought joy with them wherever they went. Someone who kids were excited to see. That was one of my main qualifications actually. By the end of the day, we had painted the sky. It was an accomplishment. My dress had blue brush strokes all over it. I had given into the idea of getting paint on my dress and decided to make my dress the "refugee kid paint dress" and that the paint from the kids would be a souvenir for me to remember. His name was Mazin... He looked like an anime cartoon character which big brown eyes, and a bit of a spike to his hair in the front. While visiting his classroom to let the 3rd grade class know that it would be their time soon, he handed me a folded up drawing. I could not believe that a 3rd grader could draw like that. The war was clearly a strongpoint in his life. I would be getting more of his drawings and they would start to have a pattern to them. School let out. I leaned against the black iron gate with Lina and we watched the kids scamper out of the school. When they noticed we were sitting there, they would come back towards us and thank us for the backpacks, showing us how awesome they looked in it. They would ask Lina "Are you teaching us English tomorrow?" "Yes" she would say. They would nod and run off. In my moment of resting against the gate. I felt at peace. I loved seeing the school filled with children, coming and going. The kids would had me more drawings, flowers, and snacks. They would have given me the world if they had it. But would the world give them everything? I thought of kids back home. Everything they have is an expectation. Eating out is an expectation. Getting a new "item" every day or every week is an expectation. Expectations ruin us. Expectations are healthy for certain things, like when going to the dentist, expecting the best care. Thats important. I started this blog with no expectations, because I know that its great to plan and all but to expect things to go the way you think they will go will just be a complete let down. Kids here don't have expectations. They are just happy for what you do give them. They are grateful for the little things, such as education. I felt like I was sitting in a passageway of the divine. 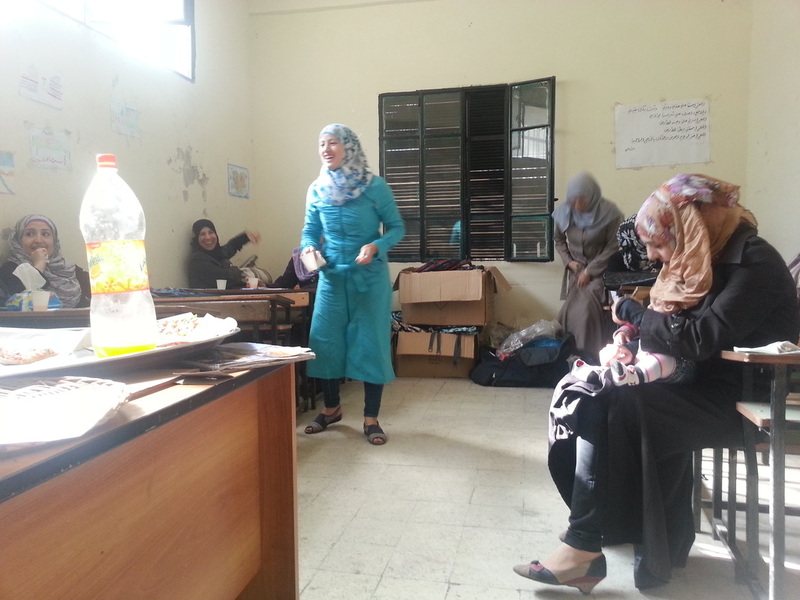 After the kids left, the teachers and I all got together in the classroom to begin our teacher training. Mustafa placed an order from the zaatar lady for some food for the teachers. He first walked in to talk to the teachers before we started the 3 day teacher training program. This was to be separate from the art teacher training I would do later on. The purpose of this teacher training program was to empower the teachers with ways to handle the kids that would make their life easier and the kid's lives better. I was really there to put an end to the old-school mentality. 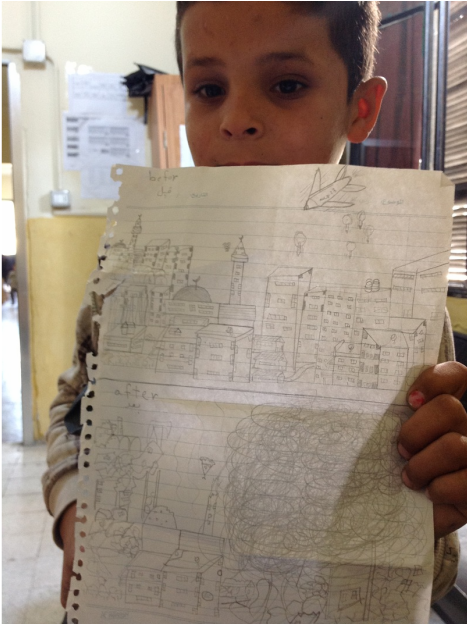 In Syria, many schools were run like a military academy. This style of teaching is engrained into many teachers. Even though it doesn't feel like the right way for them, this is what they are used to.
" In my school, there is no hitting or yelling at the kids." he began. Sama has come from America to teach us techniques and offer a cultural exchange. We have much to learn about how education is done in America. We are lucky to have her, and I expect all of you to take notes on what she is teaching you. You will also have to implement it and I will be following up with all of you to see the strategies you are using." One teacher raised her hand. "Yes I am excited to learn and we have learned lots of neat techniques in college but we were never allowed to use any of them in Syria." One teacher said. "Well, in my school, I want to hear you having fun with the kids. I want to see smiles on their faces. School should be enjoyable." he said. With that, he turned the floor to me. "Wa Alaikum Assalam" they replied. "I am sure you are tired from teaching and I thank you for being here. I know that the things we will learn together in the next few days will be beneficial for you and for the kids. You can either go to school every day feeling stressed. Telling kids to sit down, be quiet, sit still, don't yell, don't do this, don;t do that, and by the end of the day you are exhausted - OR - you can learn a bunch of cool tricks and psychological techniques and turn learning into something very fun, not just for them but for you as well. You are in a unique situation. You are dealing with kids who have gone through so much up until this point. We have a responsibility as adults in their life to be more than a teacher... to be a mentor, a friend, an ear, and 4 hours of something so positive that it could heal them." They were were nodding while I was telling them these things. "In life, we can either do what we have always done and we will get the same results or we can try something different and get new results. If you are having a hard time with certain kids in class and do what you have always done, the same thing will always happen. In the next few days, lets open our mind and our hearts, and lets think outside of the box, because this is where the heart of kids reside- outside of the box." With that, teacher training began. I wrote all their struggles on the chalkboard and we approached them one by one. I could write about every little detail, but that would just make this a longer blog than it already is. 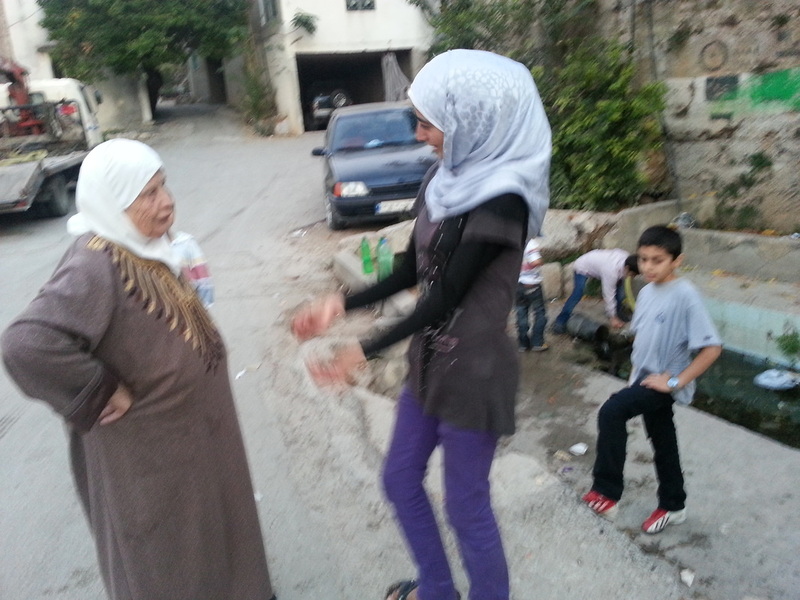 After training, Lina, Mustafa, my mom, and I walked up the steep alleyway back to Mustafa's house. On the way, Lina and I noticed how funny it was that everyone in the village liked to come and look out of their windows. It felt like that scene in the beginning of Beauty and the Beast when all the people looked out of their windows as she walked by. Lina saw some chickens and went nuts. "Sama! I love chickens. I want a picture with a chicken." I couldn't tell you how happy it made me that she was this passionate about a chicken. Anyone who was this passionate about a chicken had a good head on their shoulders. Lina spent a few minutes taking pictures of the chickens. I looked up and noticed that every window in site had a person watching from the second floor, wondering why the hell a person would like a chicken that much. My heart was smiling for this moment. In fact, there were hardly any moments when it was not smiling. I got home and then Mustafa had to go meet crazy death threat guy. I had not taken one nap since I had arrived and jet lag finally caught up to me. I took a "nap" and did not wake up till 6 am the next day. I was out. Lina and I, sitting against the iron rod gate, immersing ourselves in the busy walkway of the afterschool bus catching. 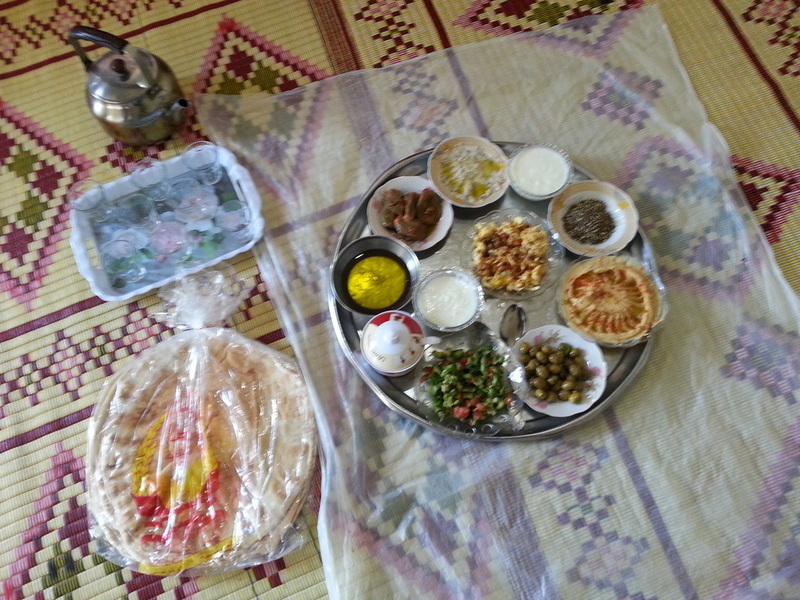 The hospitality of Mustafa and his family was amazing. Him and his family are so simple, and the entire time, with every meal, I felt like a queen. I felt so rich. I felt nourished. I was so excited. This was the day we were going to hand out backpacks. I gave the video camera to my mom and asked her to film their faces when they got their brand new backpacks. After the usual morning routine of kids running up to me to give me drawings and flowers, the principal rang the bell and the kids lined up. This was the moment I had been waiting for. "Today, we will be handing out backpacks," the principal announced. "Sama came here and bought you all backpacks and school supplies. She insisted on getting the good quality ones, so that you can keep them for the year after as well." I didn't want him to say it was me who gave the backpacks. I just got to be the messenger. Lots of people donated money to make this project happen. The kids had to know it wasn't me. "Sama wants to say something to all of you," he said. I handed my mom the video camera and asked her to film this moment. I really wanted to see their faces when they heard what I had to say.
" Assalamu Alaikum" I said, beginning with the greeting of peace in our faith. "Wa Alaikum Assalam Wa Rahmatu Llahu Wa Barakatu," they all said in unison.
" I have backpacks for you, but I need you to know that it is not me who bought you these backpacks." I said, carefully scanning their faces. A look of confusion hit their faces. If it wasn't me who got them, then who? You could almost hear their thoughts processing in their minds. " The people who live in America care about you. They think about you everyday. They just don't know what to do for you. Their thoughts are with you and they love you." I said. I could see their faces taking this information in. Their eyes looking down as if to process this thought that someone actually cares about them. " You are not alone. In all of your worries, in all of your fears. Know this. And know that kids ask me all the time how you are doing. They wonder about you. 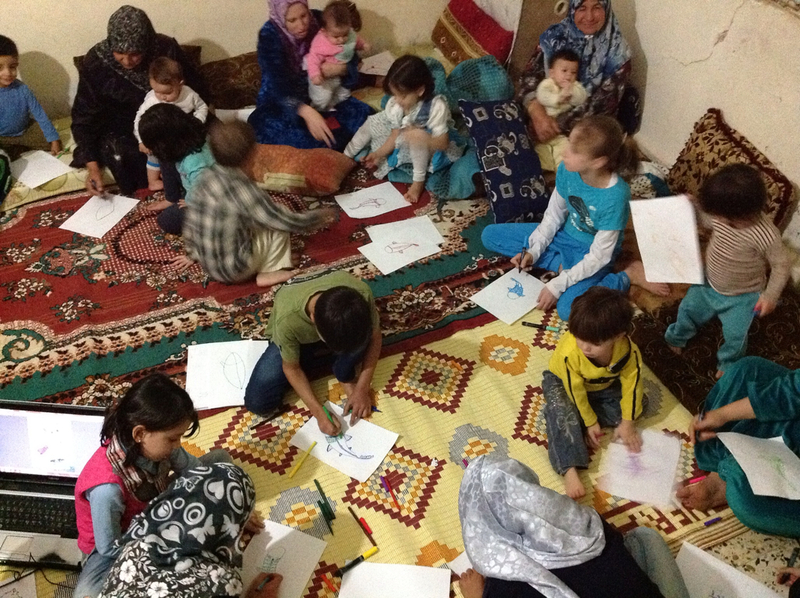 So when I said I was coming here, they donated money and they art supplies too. " One girl wiped her tears with her scarf. Another boy had his head in his arm. Like a chain reaction, the kids in the courtyard started comprehending these words and a third of the courtyard was crying. "You are loved. Don't ever forget that." I said. My mom looked at me and nodded, Lina and I caught glances and nodded. Everything about this felt right. Every atom in my body was screaming for this moment. "Each of you will get a backpack. Take care of it. And everytime you hold it, remember that you are loved." I said. With that, we started handing out the backpacks, class by class. The kids in line waiting their turn could barely handle waiting. They were so excited to get their very own backpack. It was so beautiful to watch. Even if for a moment, their joys washing out their sorrows. This brought peace to my heart. After handing out backpacks, I went from class to class, finishing up our sketches of what they wanted to be when they were older. 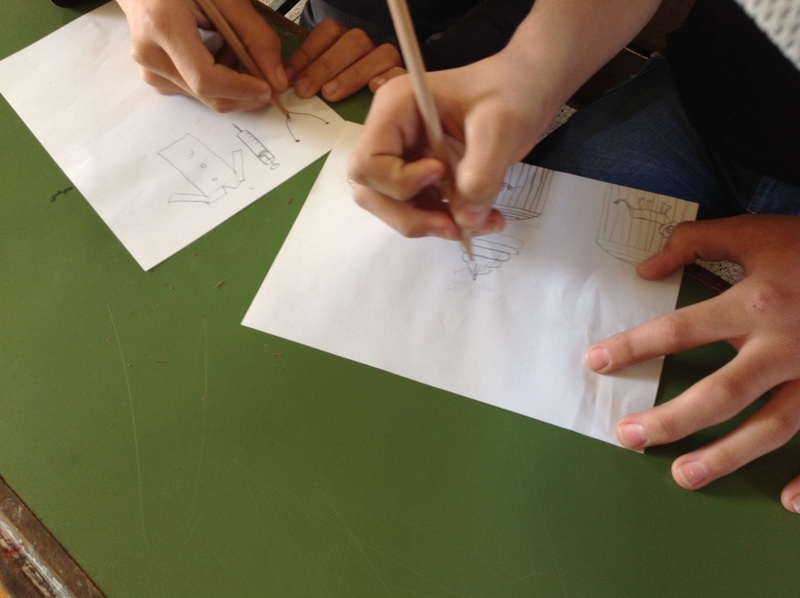 In the 6th grade class, one boy had drawn a picture of an american flag and guns. I asked him what these symbols meant. He told me he wanted to be in the American Military when he was older. A girl sitting down the way from him had drawings of fighting. She was from Homs. She wanted to be a "killer" because she wanted to kill the government for what they had done to her family. Other than that, the rest were happy to be doctors, lawyers, artists, teachers, engineers and other normal childhood icons. The one that caught my attention beside that was the drawing of tiles and stones. I asked the little red head boy with freckles what that meant and he said he wanted to be a tile worker, just like his dad. These were honest conversations we were having. 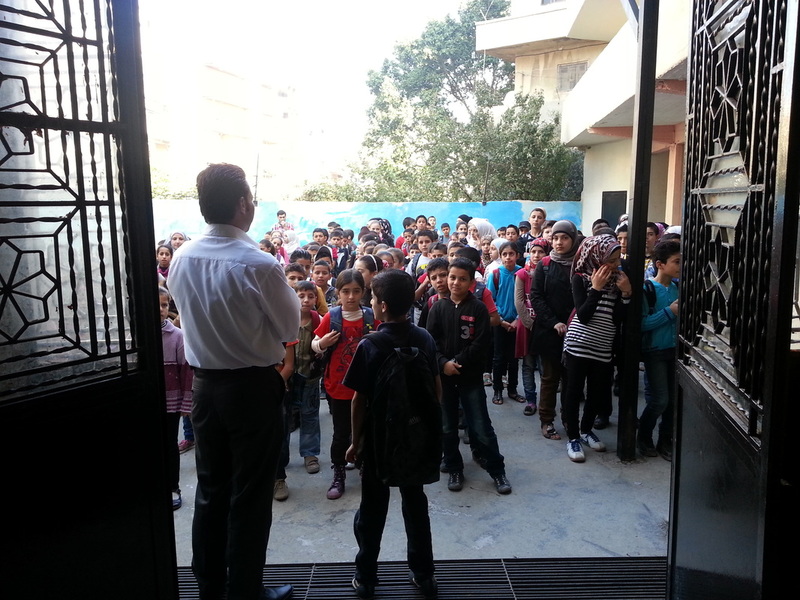 Visiting the classrooms gave me an idea which I would share with Mustafa later on in the evening. Her name is Lina Kurdi. I'll be honest with you. I was hesitant when she first said she wanted to come with me to Lebanon. I knew the amount of work that was before me and wanted to be sure that she absolutely knew that I meant work. She said she did, but today would put her to the test. Well, she definitely passed the fashion test. My style too. Green cargo pants fitted into her boots, a black shirt and a long striped sweater. A smile radiated her essence and heads turned as she walked into the school. The kids were curious about her. Who was this fun looking person who did not dress like the other teachers? What? Our new English teacher? You could hear them excitedly talking. While I was handing out backpacks, I could hear cheers coming from a class upstairs. It was the class Lina was in. Next thing I knew, during break, Lina came down the stairs with the largest grin on her face. "Amazing, they are amazing Sama. I never want to leave this place. I see what you mean now." Today was Lina's first day. She had spent the first few days visiting her relatives in Beirut. I had told her on Viber she was going to love it here. And love it she did. I was so glad she came. She truly is a hard worker and her spirit is something the school is in need of. Mustafa had a conflict which affected me while I was there. The man who he was originally going to rent the school from down the hill was making threats to the school. Basically, he was angry that Mustafa chose the school up the hill instead. Mustafa had done so for many reasons. One, it was not occupied by Lebanese students during the day, so they could actually have a morning shift and possibly later on after they got more funding, create a second shift. IT was also because the donor who he found to pay the rent liked the school up the hill more. So Mustafa had been in the school for about a week and then decided on the other school. The man now wanted $5,000 USD. Mustafa did not have that kind of money. "Well the girl from America showed up and all of a sudden you have money for a school." he had told him. Bad timing on paying rent on the school from the donor. I did not pay the rent. IT was not me. Mustafa went to go speak with the guy. The threats he was making were not your normal threats. They were serious. "If you don't pay me $5,000 by 10:30am tomorrow, I will shoot fire on the schoolbus as it makes its way through Tripoli. Don't underestimate my power." he had said. 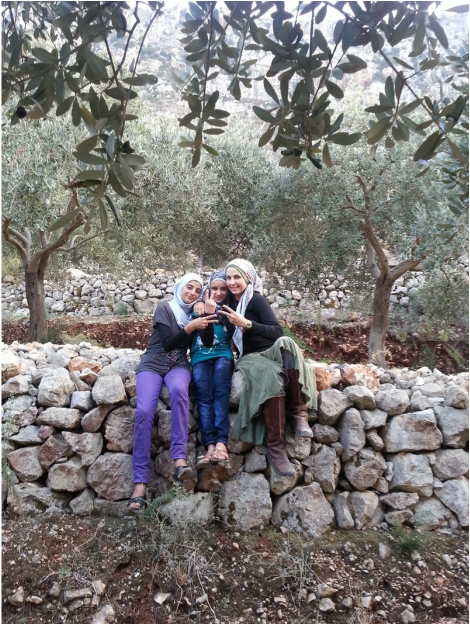 While Mustafa was meeting with him to try to talk some sense into the guy, I decided to go hiking up the mountain with his nieces and Lina. As we ascended up the mountain, the sound of the birds got louder and louder. So did the sound of gunshots. I had figured out by now that it was the military way up on top of the mountain. 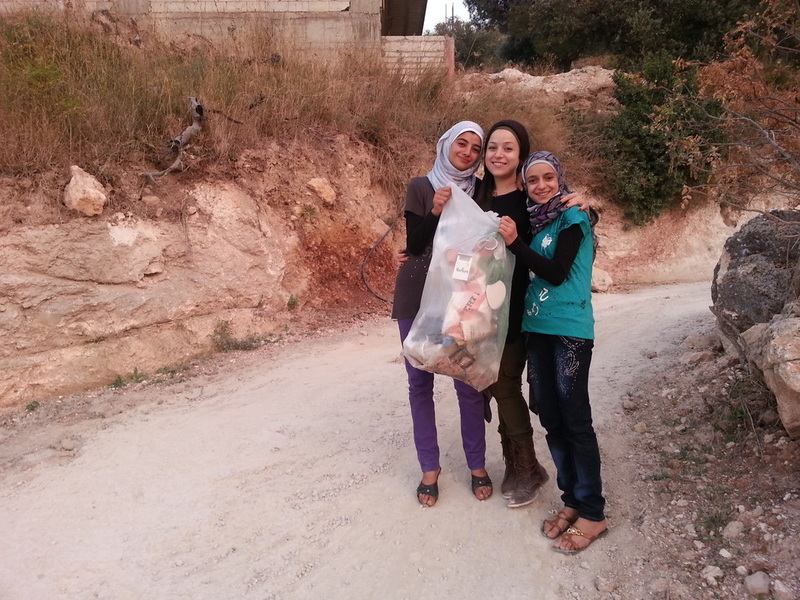 I couldn't stand the trash that littered the beautiful mountain of olive groves. We found a large trash bag and decided to pick up trash while we hiked. The red soil contrasted the piled gray rocks which terraced the hillside. Turning the corning of one of the bends, we saw a man with a large beard cutting down wood. "What are you doing here?" he asked. "We are picking up trash." I said. "What? Why?" He said, absolutely confused at the concept. "Because trash does not belong on the floor." I said. "Where are you from?" he asked. He had a nice aura about him so I was comfortable in telling him that I was from America. "America?" he said, absolutely shocked. "And you came to pick up our trash? How embarrassing for us that our own people don't care and you came from the end of the earth to pick up trash." Amani and Alaa were giggling at the conversation. We started talking and he invited us to his families house for tea sometime. A totally normal thing that strangers do to each other in this part of the world. All of a sudden, the sound of the birds got louder. The birds in this area were so melodic and had actual songs to sing. "What kind of birds are those?" I asked. The sound is so beautiful. "Its a recording." The guy said. "What? " That was the last thing on earth I had pictured in this rural village. "The hunters are using the recording to lure birds- " just then, a bullet sound went off and 2 hunters rounded the corner. He saw my face (which is unfortunately too descriptive) turn sour at the sight of those two men. "Whats wrong?" he asked me. "I don't like hunting, and I don't like those guys" I said. "They are Syrian and are hunting for food." he said. "Oh" I said. "Well, it was nice meeting you, we are going to continue our hike" I said. "No. Not alone. I don't like the look of those guys. If you want to keep going up, I will accompany you ladies." he said. Amani and Alaa were uncomfortable with this entire thing. "No Sama, lets just return." they said. "Lets just go back," Lina said, tuning into how the younger girls were feeling. "Okay," I said. "We are just going to turn around." "Okay.. No problem. Seriously though, wait till I tell everyone that girls from America came to pick up our trash. Please, come over soon for tea. We just live down in that house over there." he said, pointing to a grey cement house off in the distance. "Thank you," we said and made our way down. We all felt happy. We sang songs together and alone, each taking turns. The moment was glorious, the sky was pink, sunset was in motion. Down by the house, Ali came up to find us. "Mustafa wants you in the house." he said. As we were walking back, an old lady wearing a brown jalabiyah (one piece robe) fringed with gold thread limped over to the spring to go fill water. Ali, Alaa, and Amaani all ran up to her, greeting her. Time paused for me as I watched this exchange carefully. These kids, 11, 13, and 14 had respect for the elderly. "Can I fill those plastic bottles for you, Hajji?" Ali asked. "Oh yes young man" the lady said. "May God grant you a long healthy life." She said, handing the plastic bottles to Ali. Ali grabbed them and jumped down by the spring to fill them up. 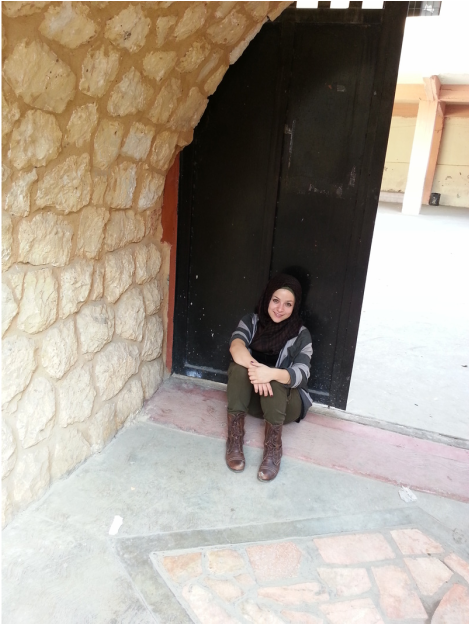 While Ali was filling them, Alaa began conversation with her. "Its been a while since you have come to our house for tea. Please, honor us with your visit soon." Alaa said. "We would love to have your company." she said gingerly, holding her hand out of respect. I was in awe watching this. It was such a beautiful moment. These kids are rich in one thing: manners. I questioned what true wealth was at that point. Was it better to raise an educated kid or a well-mannered kid? Imagine the combination of both. Mustafa was relieved to see us back at the house. He reminded me of his concern for the threats he has been getting. "Please don't go alone next time. The threats and you are in my trust." he said. It was house arrest at its finest, but house arrest wasn't so bad. The family was amazing, the food was delicious and the view was gorgeous. Back in my room, I looked at the video footage of the day. I wanted to see the kids faces when they were moved by the gesture that kids from all over cared about them. Hit play. Okay, great, Mustafa talking, him announcing me. Okay here goes, I handed the camera to my mom. ZOOOOOMMMM... into my scarf. NOO!!! She filmed the thread count of my scarf. My heart sank. That was the most powerful moment of my trip so far. I would have to repeat that speech when I handed out cards and presents later on. Everyone had to see their faces. Everyone! I felt in a way it was my responsibility to include everyone who participated in the fundraising up until this moment to witness the effect they had made on these kids. Part of me was screaming and the other part of me found it so comical I could barely contain myself. Mustafa and I talked about the day, talked about the crazy death threat guy, talked about the school. I shared with him the idea of people going into classrooms in America and talking to kids. "Why not have each teacher invite a professional person to their class each month. This person can bring things with them. For example, if it is a doctor, they can bring a stethoscope with them, a doctor outfit, etc." "We need to expose the kids to as many real world skills as possible. For some, all they know is tiling work cause their dad does that. For others, all that is in their heart is revenge, for all they have lived through. We need to give them other options." I said. "Yes, I will add this to the meeting list for tomorrow." He said. Every night, we took a half sheet of paper and added announcements for the teachers, projects to get done, things we needed to buy, etc. "Oh and tomorrow, you also need to pay for the backpacks at the pharmacie." "YES!" I said. We were having technical difficulties up until that point with the credit card due to the fact that Lebanon is a red listed country. Woke up to the sound of the roosters, a common greeting from what I have gathered so far. Mustafa and I went up to the rooftop and made the to do list for the day. We had much to do and an overwhelming amount of things to take on and complete before I returned to the US. On the to-do list was organizing the class lists, interviewing art teachers, announcing the general teacher training, beginning the mural project, filling the backpacks with supplies, completing the task of making rounds to each class and having them draw their hopes and dreams. From the rooftop, the sky was pink, the day young with thought, dispersed its illumination onto the windows of the distant cities that could be seen from this amazing view. The gloomy clouds hung low over the mediterranean sea that blanketed the city. I looked around the rooftop, rebarb wire sticking out, tripping hazards all over the place, no railways on the stairs, bricks that fell off the edge of the building if you sat on them... Yet, still one of the most beautiful places to be. Behind me, the mountains. "There is the army", Mustafa pointed out. " That is where the gunshots are coming from." A tank and green army trucks spotted a corner of the hillside where you could see men with rifles and weapons, practicing. "Also, people go hunting in this area" he said. It was 7:45 am and school was starting soon. "Hurry, go get ready!" I said. "Also, please move away if you are going to smoke." Yah, I can be pretty bossy like that when it comes to the issue of air quality. Mustafa was pretty easy going though, and handled my cigarette complaints very kindly. The kids and I ate breakfast and we were ready to go. The kids were excited to go to school. Together, we all walked down the steep old alleyways, the entire time, feeling like a quick impression of a person walking, in a painting perhaps.. Each doorway we passed was more beautiful than the last, each window, carefully aged and cracked. 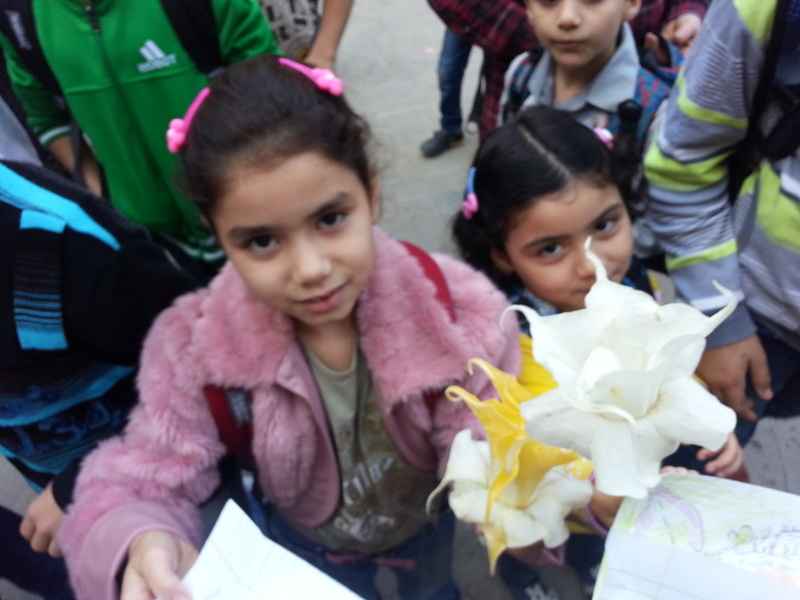 As I made my way into the school, children gathered excitedly around me giving me things. One little girl with deep brown eyes handed me a folded piece of paper. I opened it in front of her. It was a picture of dora the explorer that she had copied off of something. Another boy, about 8 or 9 years old, handed me another folded note. This note, not as cheery as the last. Split into two sections was a before and after picture. The top was Homs before the bombing. It said "befor". The buildings were in tact but you could see missiles starting to drop. The bottom half said "After" and had the buildings in the same spots but half of them were missing. Some were scribbled over. This was fascinating since I had only asked the kids to draw what they wanted to be when they were older. Perhaps it was hard to do that until they could express to me what they had seen. This boys eyes spoke of a deep sadness, one that perhaps a mother gets after her kid dies but is trying to mask. The scars on his face perhaps were the evidence of his story. As the principal walked up to ring the school bell, kids started handing me folded notepapers in the dozens, along with their snacks. I could barely hold anything anymore. 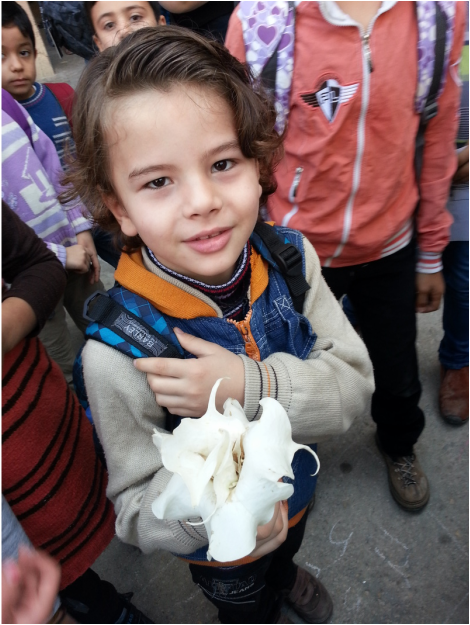 One little boy handed me a large white oleander flower. It felt like my birthday on steroids, gifts, after gifts after gifts.. I the form of drawings, chips, snacks, and roses. I started stuffing the folded notes into my boots, a storage pantry for my days belongings. It wouldn't be long till the kids figured out that they could just walk up to me and stuff the drawing right into my boot. It was like my own personal mailbox. The bell rang and the kids scampered to line up. "Kids. What did we talk about? I still see trash on the floor." 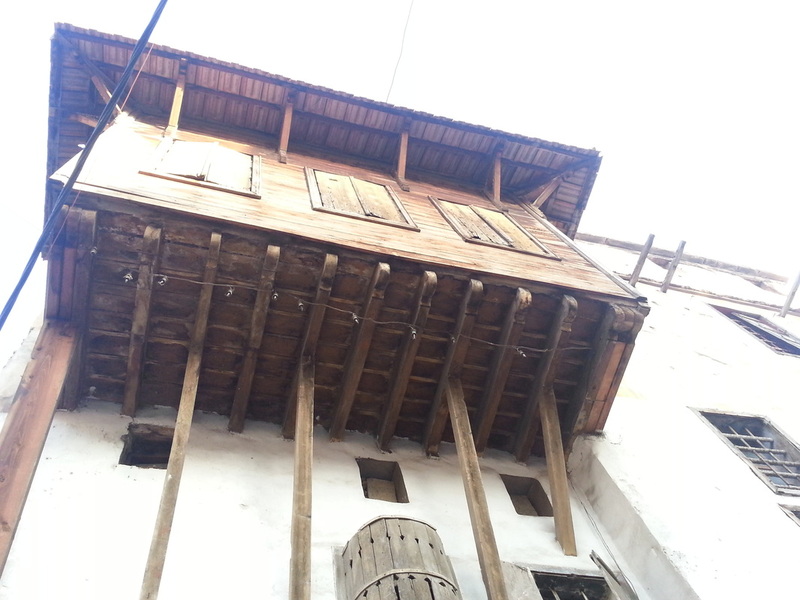 Mustafa's voice boomed over the courtyard. One kid walked over and picked up the empty bag of chips that was laying on the floor. "Clap for him!" The principal announced. The courtyard burst into a large clap for him. The boy smiled and proudly walked back to his line. "There is something important I need to talk to you about. As you know, We are starting a new year and we do not have a name for our school yet. We are going to vote on a name. Sama and I will be coming around to your classrooms to vote on a name for the school. You have three names to choose from: TUyoor Al-Amal (Birds of Hope, or Hope in Flight), Amal Al-Mustaqbal (Hope of the future), and Madrasatul Amal (The school of hope). The school is not run by me or your teachers, but it is successful when all of us have a voice in what happens at our school. We want this to be the best school. A school where you have a choice of what you want to name your school." Mustafa said. The kids cheered. This was a new concept for them, for in Syria there was no such thing as kids having a say in anything important. This meant a lot to them. I couldn't help but think of the time I was doing my Master's Thesis on the water crisis in Syria. One of the problems I was trying to get to the root of was WHY people felt it was okay to just throw their trash on the floor. The reason I had come to was because they were not allowed to take part in their country. They felt no ownership of their country and therefore always felt disconnected from anything that went on outside of their household. When a person has the right to choose or at least have their voice heard, they are more interested in the future of the place, more interested in the outcome, more interested, period. The conversation we had the night before was about how to run the school. What is the core philosophy that will govern this school. Lets be real. When the kids graduate, their papers won't mean anything if the Assad regime is still in power. 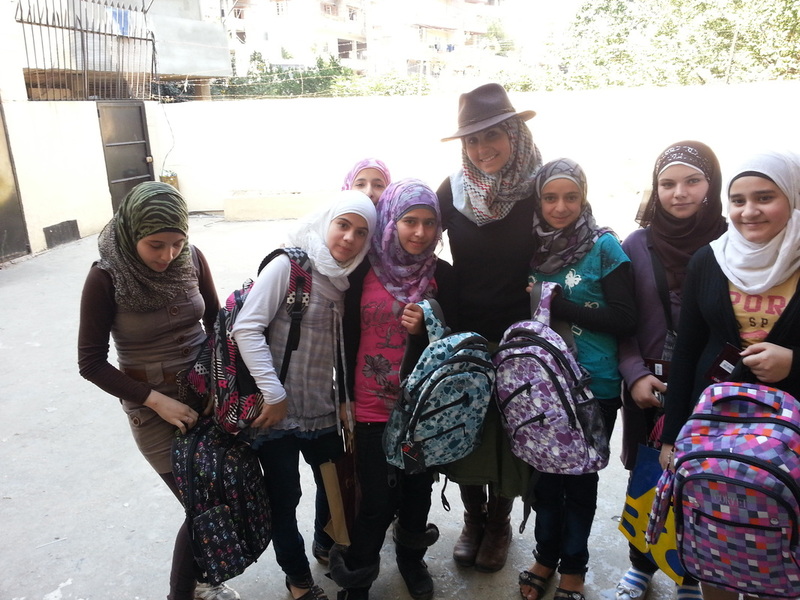 Their education will not be formally recognized by the Syrian government or the Lebanese government. They therefore will have to learn some useful skills while they are in school. Perhaps we should run the school like how we hope Syria will be run someday. We can vote on the name of the school. We can have the kids clean their own trash, clean their own courtyard. We can teach the kids things they can make and sell as well as all aspects of a business, from the idea to production to sales. The entire school will feel like they are taking ownership in raising funds for the following year. In the meantime, it will help them move on while also teaching them valuable skills. By the time they graduate, they will know how to dream and act on that dream, how to complete a project, and how to move on in life. It is the art teacher's role to make that happen, which meant that I was to be very picky about who I chose for the art teacher. I was excited to interview my first two art teachers after the assembly. My first interview came. She was a woman with a pointy scarf, a brown plain blazer, and brown pin striped pants. She came prepared with an art lesson as well. I brought the paper and the pencils and told her she could choose whichever class she wanted. She chose the first grade class. SO far so good. She handed out the papers, gave the pencils out, and then drew a rectangle on the board to show them an example of the direction they need to place their paper in. The kids were following. She then started drawing a bowl, giving step by step instructions. THey followed. So far so good. Then a kid drew one part wrong and she yelled at him, erased it for him, and then drew it for him. THat was the moment that she failed. As far as I was concerned, although she was good at showing the lines, her teaching style is oldschool. What topped it for me was when a kid got up and was in the aisle, she pushed him back into his seat. Okay. Art teacher interviews were not off to a good start. At least I had another one today! "Sure, when my daughter has a homework assignment, I always draw it for her," She said proudly. It was then I knew it was a no go. 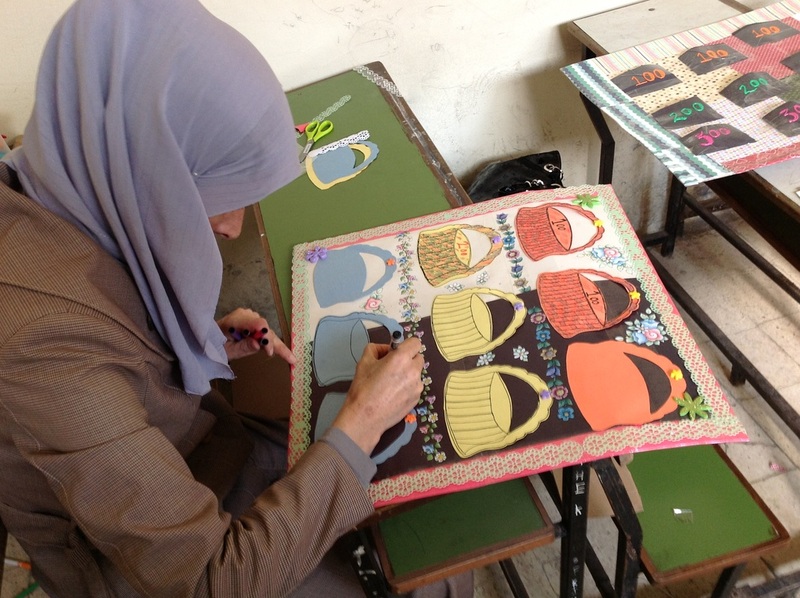 Plus, the veil covering her face was not the warmest thing I needed a kid to look at during art lessons. Hey, Im all about people dressing however they want, but art is all about expressing yourself, including your face while you are teaching, and if your face is covered, its pretty disconnecting. First day of Art Teacher interviews was a complete flop. Nobody fit the bill yet. I still had 4 more to go, so there was still hope. The bell rang for break. I didn't want to miss break and never did. Kids scampered out of their classrooms almost pushing each other to get outside. 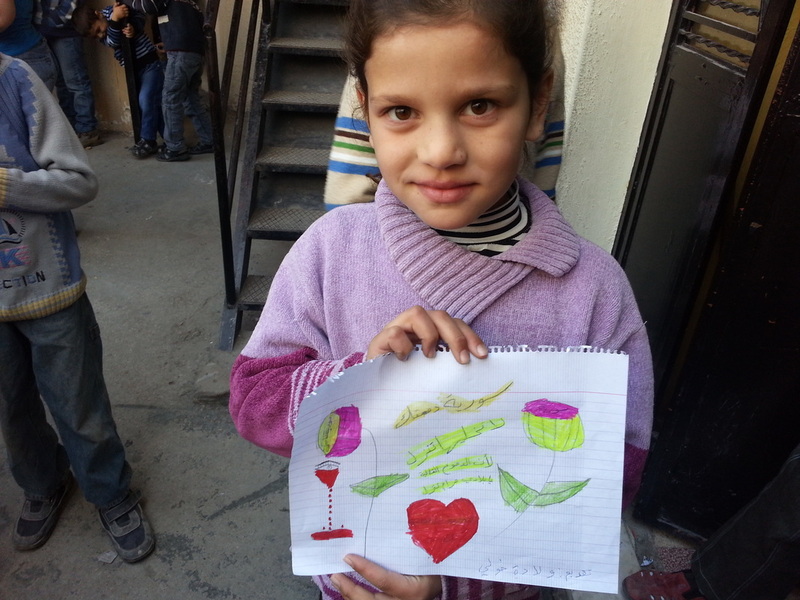 As soon as I step outside, kids circle around me to offer me chips, drawings, and flowers. I wondered where they kept getting the flowers from. 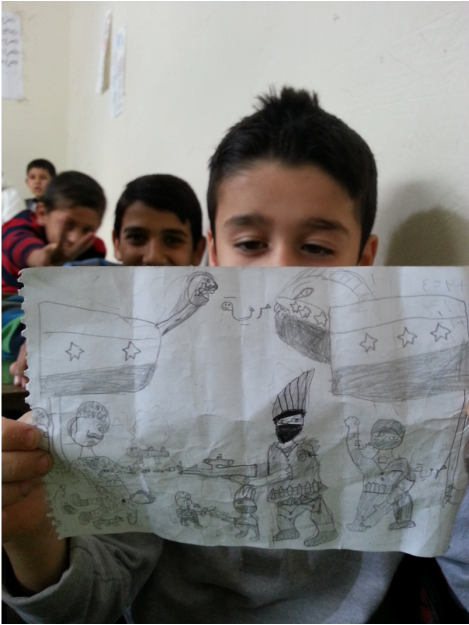 One kid then handed me a folded drawing. I opened it and did a double take. IT was rose crying blood. It was so expressive. I took a picture of him and noticed his haunting eyes. Those eyes have seen so much and have felt so much pain. As we walked home that day, past the zaatar bakery, past all things old, I thought about all that had happened so far. I had only been there for a few days and already so much was happening. At the house, Mustafa had visitors. Actually, there was almost never a day that went by when people weren't dropping by to talk to him or handle school related stuff. I told him that if we thought we were going to get stuff done in between visitors, it would never happen. Mustafa was the point person for the area to hand out bread rations for the UN. So, when he wasn't doing school stuff, he was constantly being asked for to see if a family could get bread. He was too busy to wait for to get a project done. I looked up at the army of kids he had in his house and decided it was time to involve them in everything we did. "Let me and the kids count and organize all the textbooks so we can see how many more we need to buy." I said. He agreed and the kids and I went into the other room where the books were all stacked and started organizing, counting, and sorting... We put a number on each book with the total count. 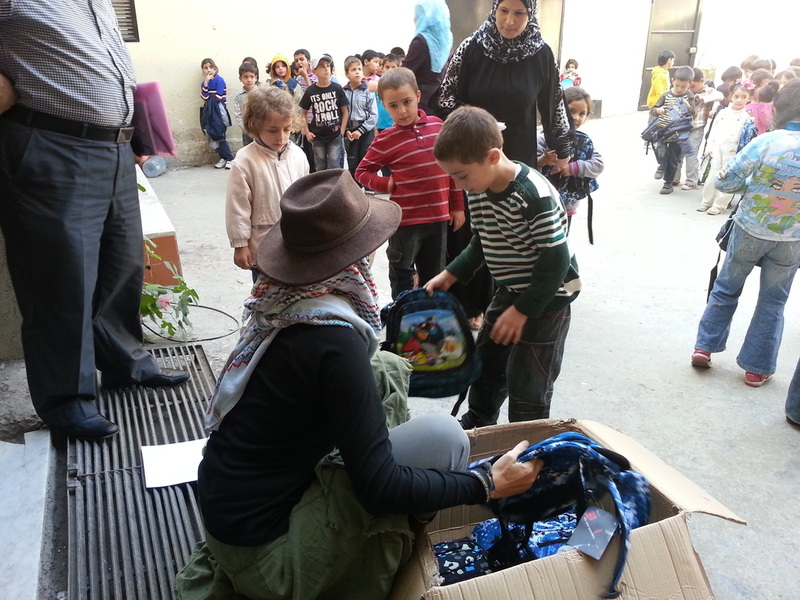 After textbooks were finished, We needed to start preparing the backpacks we bought. After removing the plastic wrap off of each backpack, we made an assembly line and placed one pencil, one eraser, one ruler, one pen, and 2 notebooks in each backpack. We had to sort girlie stuff from boyish stuff. I so enjoyed working with his nieces and nephews. We were an awesome team and they were hard working. At one point, I recommended that we take a break. They refused and said they wanted to get it all done first. By the time we finished everything, it was 10pm. I still needed to sit down with Mustafa, since he had been busy day and night, to talk about the project, what we needed to do, and check in on our "To Do List". One thing on our "To Do List" was to pay for the backpacks. I had to go to some guy named Sadeq and then take him to a pharmacie where we could use the credit card machine. Then the pharmacie dude and Sadeq would handle getting the payment to the backpack guy. Complicated but at least someone was going to help take the credit card. At 1am, the rooster yelled across the alleyways. I would soon learn that 1am rooster sound, since most days to follow, I slept after 1am. Dear Rooster who crows at 1 in the morning, I have a message for you. Although you are unlike the other roosters who wait till the crack of dawn to wake everyone up, I like your uniqueness, courage, and willingness to make your 1 am announcment. We all decided to paint a huge mural on the wall. 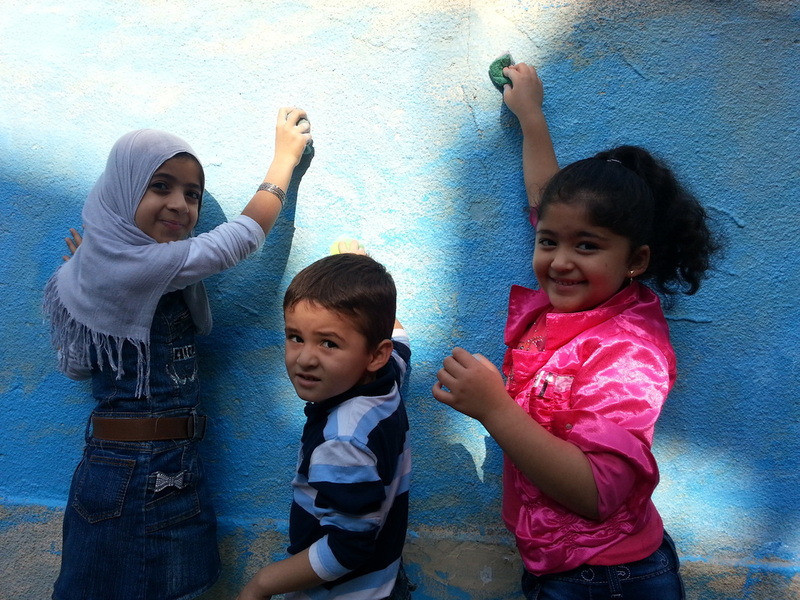 The theme of the mural is "Hope for the future, what I want to be when I grow up, I dream of peace". I visited the classes before yesterday, each one and did a talk on how you can be anything you want to be and you have to just imagine it. IT was almost tear jerking to see these kids raising their hands one by one and standing up proudly to say "I want to be a doctor", I want to be a nurse, I want to be a minister, I want to be a teacher." Then I drew a circle on the chalkboard and told them to start imagining symbols for what they wish to be. They will be drawing these symbols on the mural we are going to be doing as a group. 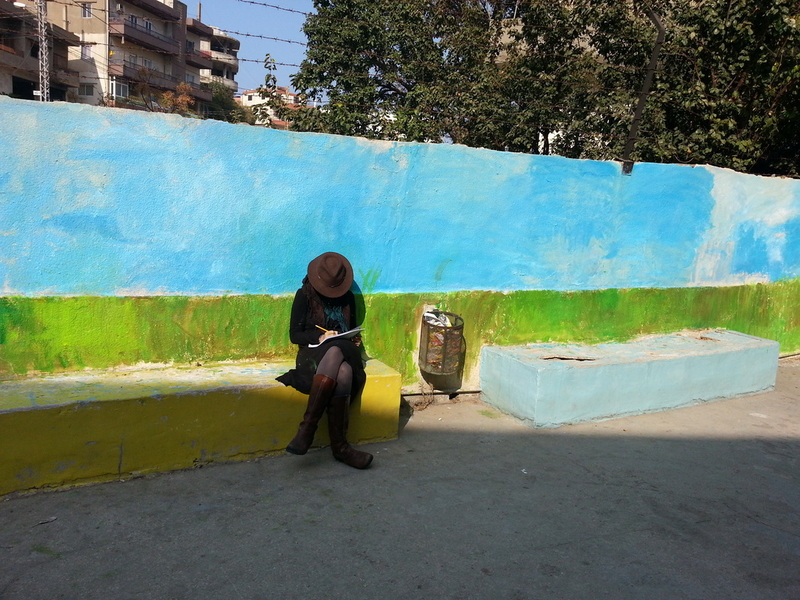 Tomorrow morning I will be visiting the classes to go over their sketches and then the mural project will begin. The most touching news I received without soliciting the fact that it was an art therapy project was that a mom came to the school today to find me. She said that is it true I asked the kids to start practicing their sketches? I said yes. She said she didnt believe her daughter at first when her daughter said that a lady came from America to draw with them. "I decided to come to the school to see if this was true." THen she told me that her daughter had been suffering from post traumatic stress and she has had a hard time at home with opening up. She said " the entire evening after you told them to start sketching ideas at home, my daughter was drawing non stop till 11 at night and that she was so excited and kept talking about how you said she could be whatever she wanted to be, so she is going to be a doctor, so she can help her older brother with his autism. This was the first time I saw her open up this way." Her eyes watered and she said "Thank you" My eyes then watered in return. I couldn't believe that a simple assignment like this had such an effect on a child of war. Thanks to all of you for your support for making this project happen. I am ONLY here because YOU are here on this journey with me. I will keep you posted as this project unfolds. Lots to do, Mom and Lina arrive at the school tomorrow. Im excited because the school is desperate need of help. Lina will be filling in as the English teacher till they are able to find someone and my mom will be filling in as another teacher of some kind. (She does not know this yet. She is arriving as we speak) If anyone wants to come help at this school, they need all the help they can get. I can find you a family to host you. The kids will help you with your happiness, more than you can ever imagine. 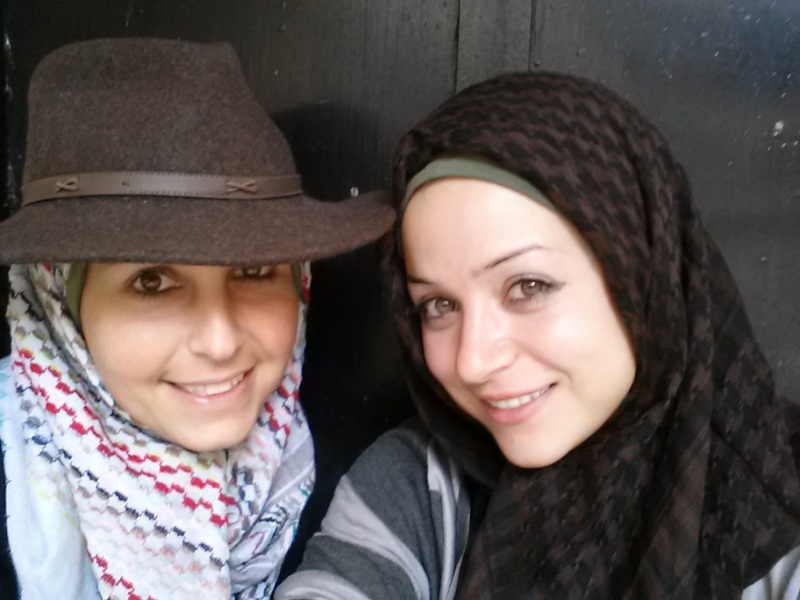 My cousin crossed over from Damascus to see me today. He was on his way to go to Egypt and seeing him for me was a huge thing. Its the first time that Ive seen any of my family in 5 years, especially since the war started in Syria 3 years ago. Its an odd thing to sit in front of your family member knowing that all the things they have absorbed with their eyes have been brutal in the last few years. Its a weird feeling to try to talk about anything good in your life when you know nothing has been good in their lives. I love my cousin to pieces... I love his mentality and his forward thinking. If all of Syria was like him, Syria would be at peace at this very moment. ALso, another VERY HUGE THING HAPPENED TODAY. My uncle that was a homeopathic healer that died 9 years ago and nobody ever had written down any of his treatments came up in a conversation with my cousin's driver, who safely crossed him across the border of Syria. His driver turns out to be my uncles good buddy. He told him has all of his natural medicine treatments written down. I started crying when he told me that, cause my biggest regret in life is not spending time with him in Syria to learn everything he had and then the knowledge died with him. So.. Its been a beautiful journey and Ive only been here for a few days. 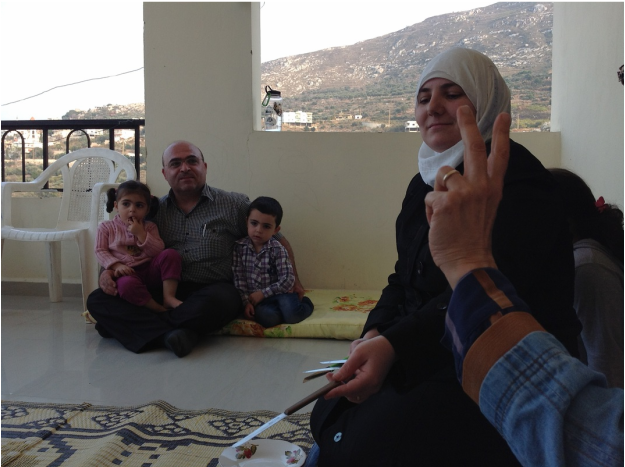 After returning back to Mustafa's household, where his sisters and sister's kids filled the house with nothing but warmth and love, I sat in their presence looking at their lifestyle. All of them sitting together on the floor in one room. Even the kids, just sitting there. I wondered what an art lesson would be like with all of them. So, I decided to not be lazy and go get markers and paper. I handed each person in the room who wanted to a white paper and a marker. I was a bit surprised that even the adults wanted to learn how to draw as well. I taught them step by step how to draw a fish. They were so into it, following my instructions line by line. I didn't have to go to any person and help them individually, they were all naturals. 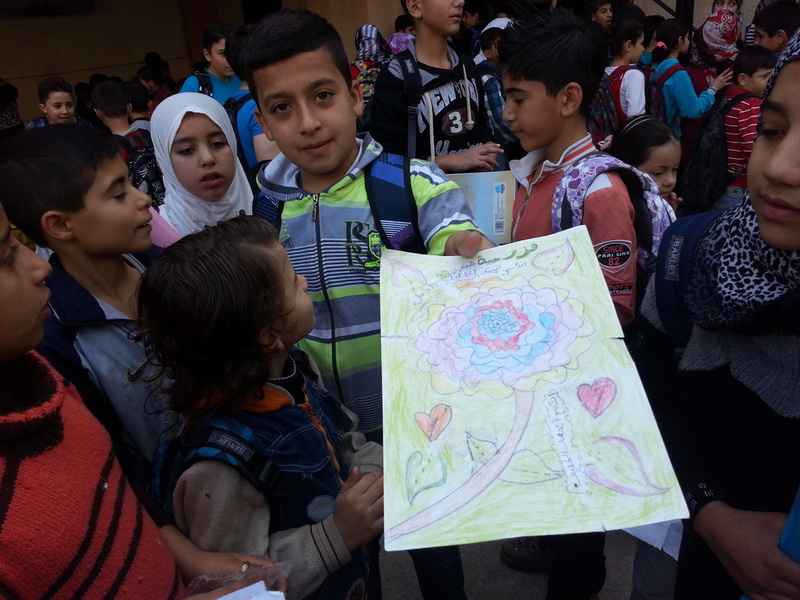 I was impressed by their art, and was excited in the days to come to see what the kids would make. The day was filled with so much goodness. I was happy for all that has happened so far, but Im sad. Sad for the idea that I've only been here for a few days and Im attached more than separation can bare. I used to pride myself on being stronger than this. Im counting down the days till my departure and dreading every second that passes. I feel as though I am in the arms of angels, In the presence of God, and in the protection of the olive groves and steep mountains that surround this town. Hi. I'm a Syrian-American Artist, writer, and educator with far too much thirst for adventure.